TWO former US government peace envoys to Northern Ireland Richard Haass and Mitchell Reiss have been mooted as candidates to chair Stormont talks to secure agreement over flags, parades and dealing with the legacy of the Troubles, The Detail has learnt. The Detail understands their names are on a list, agreed by the leaders of the main Stormont political parties, which also includes a high-profile Northern Ireland figure in the field of reconciliation, plus a senior figure from South Africa. What isn’t clear is who – if any – have been approached at this stage. The plans have emerged following the speech given by President Barack Obama in Belfast which is seen to have injected fresh energy into the efforts to broker a deal on the key stumbling blocks that continue to threaten the political process. Today The Detail reports on events behind the scenes of the presidential visit and the meeting of world leaders at the G8 summit in Enniskillen as Stormont officials and Downing Street jostled for position to secure maximum positive publicity. There are indications that Northern Ireland political leaders Peter Robinson and Martin McGuinness believe they have benefitted from the events of the last week and a favourable climate has now been set for their planned all-party talks. It is understood political parties will each appoint two people to the talks group, which will then divide its work into three categories: flags and emblems, parades, and dealing with the past. The independent chair to lead the talks could be announced within two weeks, though there was discussion about also appointing senior figures to help coordinate the work. Mr Hasss was appointed in 2001 as the US government’s special envoy to support the peace process when President George W Bush was in office. In Northern Ireland he was viewed a careful listener, but a tough diplomat who did not mince words when either republicans or unionists were seen as steering the peace process into troubled water. He played a key role between the parties in helping to shore-up the peace process after the suspension of the power-sharing government. 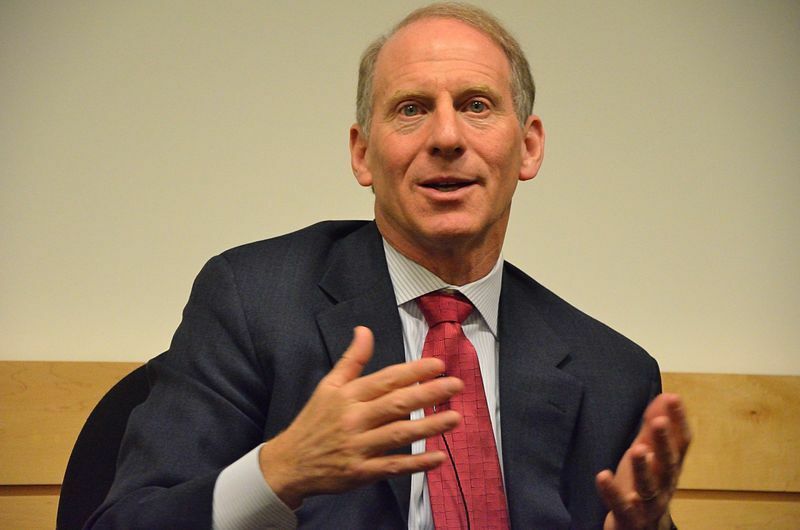 When Mr Haass ended his term in the role, he was succeeded by Mitchell Reiss in early 2004 who went on to play a prominent role in his own right. It was not the first time they had swapped roles, since Mr Reiss had previously replaced Mr Haass as Director of Policy Planning at the US State Department. The news that they are among the personalities that all parties agree they could trust to do business with, comes after President Obama pledged continued US support for the peace process. 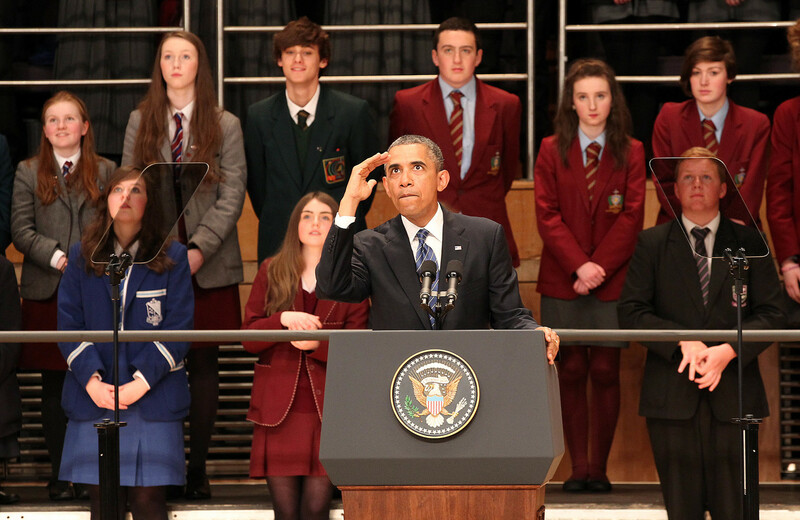 Mr Obama landed in Northern Ireland on Monday morning and delivered a keynote address at the Waterfront Hall. His arrival was preceded by a series of carefully planned political announcements in Belfast and London which represented a bid to get the peace process back on track following the months of violence surrounding the flags crisis. Disturbances broke out following a decision to restrict the flying of the Union flag at Belfast City Hall, but this came as unionist and republican leaders were already at odds over parades which had sparked riots last summer. The damage to political relations heightened demands from the British and Irish governments, and from the US administration, for progress to be made on policies aimed at tackling sectarianism in Northern Ireland and building a shared future. The outcome was a series of announcements which began on May 9, as reported here, when First Minister Peter Robinson and deputy First Minister Martin McGuinness launched details of their blueprint called `Together: Building a United Community’. It proposed a series of initiatives including a target date for removing peace walls in Belfast, plans for ten `shared education’ projects to bring children from Protestant and Catholic schools closer together, plus the plans for an all-party working group to agree on the most difficult sticking points: the flying of flags, the oversight of controversial parades, and dealing with the legacy of decades of violence. It followed public pressure from the British government which said it would provide economic support for the Stormont administration if action was taken on delivering shared future strategies. The outcome was criticised by political opponents of the DUP and Sinn Féin, though the sceptics were careful to adopt a public position of being seen to be ready to test the pledges, rather than simply dismiss them. There were concerns in some quarters that the shared future plan was aspirational, and that the British government economic package was low-key in comparison with ambitious packages pledged in the past, as also reported here. But nevertheless, the key players had done enough to ensure that a more positive environment had been created for the imminent arrival of the G8 and in particular, President Obama. In the period in advance of his arrival, however, the US administration was lobbied by a series of groups who had concerns that the President may strike too optimistic a pose when he arrived in Belfast. A number of campaign groups highlighted their concern that the President’s address may focus on the historic achievements of the peace process and – in the wake of the initiatives announced by Stormont and Downing St – fail to highlight the faultlines in the political process. One senior US diplomat was lobbied by the SDLP, while other organisations from outside the political world sought to inject what one called “cold reality” into the words being crafted for the President. In the end, his speech at the Waterfront was given to an audience dominated by teenagers and which focused on the need to build a new future. Before the president landed in Belfast it was said that planners wanted to establish a theme for his day which would be established at the Waterfront and continue throughout the remainder of his engagements. It was clear before he took to the stage at the iconic auditorium on the banks of the River Lagan that the theme was to be Northern Ireland’s young people and their future. The audience was impressed by the confident performance of 16-year-old student Hannah Nelson who was chosen to open the event. “I think that it is easy for some to just sit back and hold onto the past. For peace to be an actual reality, however, we all need to take responsibility in the present,” she said. Her words were an appeal for a positive future for her generation, but it was also possible to see that between the lines – no doubt cleared by the US authorities in advance – there was possibly a gentle rebuke for those in society who are holding back the new era. In his speech the President said Northern Ireland had come far, but still had “much work to do” to dismantle religious divisions, with Mr Obama urging: “We need you to get this right”. Later the President travelled to Enniskillen to join the G8 summit at the Lough Erne holiday resort – but first used a window of opportunity to visit a local school with Prime Minister David Cameron. Planners had identified at least one other Co Fermanagh location where the President and Prime Minister could have met school children, but it was ruled out due to its remoteness and inability to land a helicopter. In the end the team selected an integrated primary school in Enniskillen to provide a chance for the two leaders to meet the local community, but also signal their support for politicians to invest in the next generation. The shared future blueprint drawn-up at Stormont supports shared education – in which children from separate schools operate on a shared campus – instead of fully integrated education where children of all faiths are taught side by side. 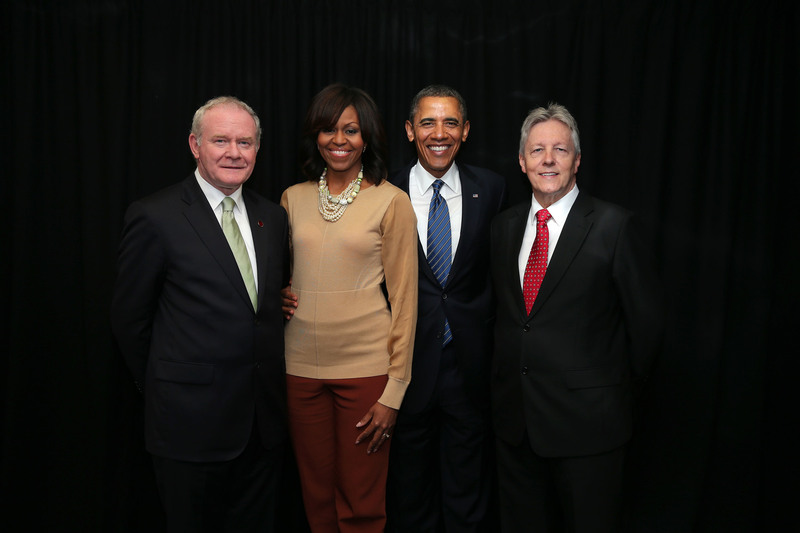 There had been speculation that Mr Obama may visit a shared education project to directly endorse the Stormont vision. This fact, plus reports of dissatisfaction among the integrated movement with the Stormont shared future plan, led observers to ask whether the eventual choice of venue represented a snub to the First Minister and deputy First Minister. The reason for the choice is more likely to have leaned more towards logistics, but was also affected by the fact that Downing Street led the planning for the visit. There has historically been some tensions between the needs of Belfast politicians and those of Downing Street when the Prime Minister comes to town. It was also the case that strategists were likely to have been reluctant to dwell too long on engagements outside the G8, given that it was the main event. By Monday evening, however, when Peter Robinson, Martin McGuinness and other Northern Ireland ministers attended a gala reception for the foreign press corps at Enniskillen’s Castle Coole, they were satisfied that they had made a success of the G8. It was November 2012 when the British government announced that the G8 was to be hosted in Northern Ireland. The announcement triggered a major security operation, the preparations for which were to dominate headlines, while behind the scenes Stormont leaders set about trying to maximise their share of positive publicity. Marketing images that tapped-in to both business and tourism were commissioned and delivered in time for the G8 and placed in the packs given to G8 delegates, to the media and used on a string of platforms. In addition to the marketing plan, political strategists sought to maximise benefits for Mr Robinson and Mr McGuinness. This led to an element of competing agendas with Downing St who prioritised the Prime Minister’s role as G8 host. In the end the First Minister and deputy First minister attended an hour long reception with the G8 leaders at Lough Erne, having earlier greeted many of the delegates as they flew into Belfast. The G8 itself went smoothly, with Fermanagh showcased at its best thanks to the weather and protests marches that made their point peacefully. And in a bonus the Stormont leaders hosted the Japanese Prime Minister at a high profile visit to Titanic Belfast – an initiative that had already been planned – but which nevertheless featured among a number of important opportunities this week to set-up future contacts with overseas administrations. And having secured at least a fairly brief private meeting with President Obama, there was enough balance in his speech for it to be read as a “pep talk”, but not as a rebuke. While Mr Obama pressed for further progress to secure the peace process, he also detailed his understanding of the difficulties of securing political agreement for controversial political reforms. He compared the effort to fight sectarianism with his country’s, and his own family’s, historic experience of racism. The implication was that he understood the scale of the task – a comfort to the Office of First Minister and deputy First Minister. But he is also clearly seeking results. Peter Robinson and Martin McGuinness have had a very good week, and they can now look forward to bringing the other parties back around the talks table. The photocalls are now over. The new chair of the Stormont talks faces a tough task. Did Cameron and Obama bottle or botch the schools' debate?